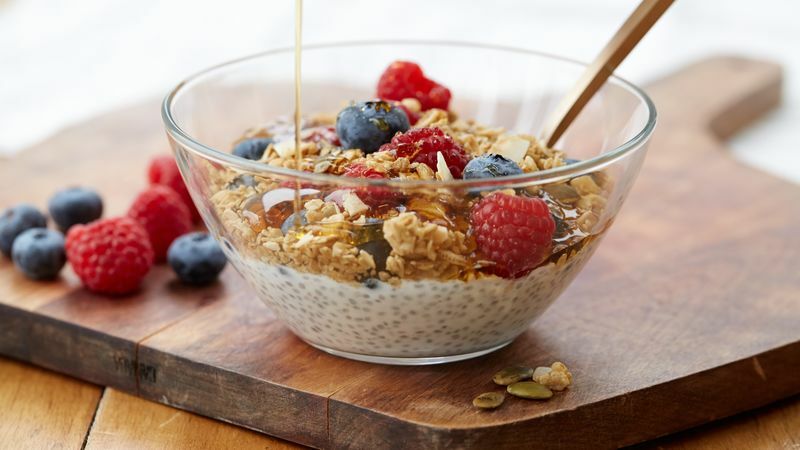 In medium glass bowl or 1-quart glass jar, mix kefir and chia seed with whisk. Cover and refrigerate at least 1 hour or overnight to thicken. Before serving, stir kefir mixture. Divide mixture into 4 individual serving bowls. Top each with granola, blueberries and raspberries. Drizzle with maple syrup for added sweetness. This recipe makes enough for 4 servings, and the kefir mixture does not need to be used all at once. The kefir mixture will keep in the refrigerator for up to 3 days. Individual servings can be made as needed. Enjoy the fruits of the season! Top this chia pudding with peaches, plums, strawberries, pears or pitted fresh cherries. No fresh fruit? Try frozen (thawed) fruits instead.